A system is only as strong as its weakest point. A blast furnace is only as strong as its taphole. Seven Refractories is a leader in the research and development of environmentally friendly products in this sector. The strategic target in Seven’s product architecture is the engineering of the cleanest taphole clay currently possible by lowering the noxious elements contained in some raw materials. The biggest and most advanced blast furnaces in the world are running on Seven Tap. To date, more than 50 blast furnaces on four continents have been supplied with Seven’s environmentally friendly taphole clay. The biggest furnace amounts to 4.400 m3 working volume, the most productive one to over 12.000 tons per day. Seven takes alternative engineering routes to obtain suitable properties of the binder system, in order to guarantee the lowest concentration of potentially carcinogenic compounds such as Polycyclic Aromatic Hydrocarbons (PAH). Consequently, the entire Seven tap product range has a concentration of benzo-α-pyren below 5 ppm (ten times lower than the 50 ppm danger threshold established by the German Ordinance, directly deriving from EU directive 1999/833/EC, and representing the leading guideline among environmental legislations of all EU countries). Eco-friendly resin bonded: in addition to the banning of tar, a further selection of alternative raw materials pursued to minimize to traces the content of even the less dangerous volatile component. High alumina raw materials: to keep high mechanical strength of the product and to make it suitable for contact with liquid metal and slag. 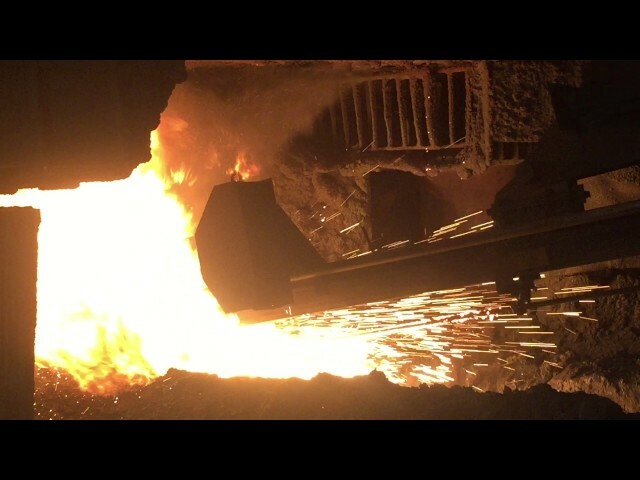 Thus, Seven offers a refractory material fully compatible with the iron industry environment, able to perform at the highest levels of furnace productivity. Top performance: an absolute must for today’s competitive world, achieved through constant research and development focused on the development of specific additives such as carbides, nitrides, and anti-oxidants. Seven’s efforts are aimed at enhancing the absolute performance of the taphole clay, but also at adapting its behavior in the different operational situations of the blast furnaces all over the world. Fast curing: Speedy curing times are absolutely mandatory to guarantee the perfect holding of the closed taphole, whether in alternate casting or when running back-to-back operations in consecutive casting. The faster the curing time, the shorter the exposure of the mud-gun to the heavy conditions of the taphole face. Fast curing also enables very pushed casthouse operations with short intercasting times typical of the single-sided casting practice as the perfect holding of the closed taphole is ensured. Fully customized workability: designed to adapt to different operating conditions, and to different drilling and plugging machines of various power, design and manufacturer. Traceability: Each Seven Tap piece is numbered and therefore directly traceable in terms of raw materials, production process, and delivery. Consistent product quality: A constant monitoring of the production process in several of its phases enables Seven to promptly intervene even in case of small deviations from the given targets, and steady verification of the aging with time enables the delivery of the only selected and proved material to the final customer. Quality controls are carried out regularly in several independent laboratories to certify the lowest concentration of hazardous substances compared to products currently on the market. All raw materials are selected and tested in our laboratories with utmost accuracy. A barcode system allows for easy and full traceability of each element in our production line. Specific continuous monitoring systems are adopted during long transportation routes. This is essential for a material with high sensitivity to temperature, in order to better evaluate any potential stress the material undergoes during the path from production to delivery at the customer end. Each Seven taphole clay is packed in sturdy cardboard boxes on wooden pallets, all individually PE wrapped. The packaging is specifically designed to permit stacking of up to 4 pallets, with obvious space-saving benefits in warehouse storage. The box opening system allows for easy ergonomically correct access and handling of the pieces.